Samford University began Homecoming weekend with a Friday night banquet to celebrate the close bonds that all alumni share, and to recognize five graduates for special accomplishments. 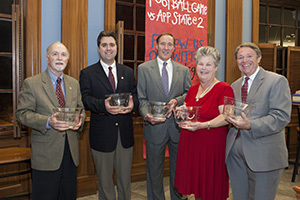 Alumni of the Year awards were presented to Kerry Gossett, Classes of 1973 and 1982; James Huskey, Class of 1969; MaryAnn Buffington Moon, Class of 1976; and Rickie D. Moon, Classes of 1977 and 1997. Patrick Devereux, Pharm.D. Class of 2005, was named Outstanding Young Alumnus. Samford Alumni Association president Keith Herron pointed that that with more than 30,000 living alumni, Samford has a large pool from which to select those worthy of recognition. This year's honorees, he said, lead exceptional lives and have outstanding careers. "They make important contributions of time and financial resources to their alma mater," said Herron. Kerry Gossett is co-founder of Anesthesia Resources Management, Inc., in Birmingham, clinical director of anesthesia at St. Vincent's Hospital, and regional vice president of clinical services for AmSol anesthesia management solutions company. He earned a bachelor's in nursing before returning to Samford to earn a bachelor of anesthesia degree. Gossett is involved in mentoring as well as fundraising to support initiatives at Samford's Ida V. Moffett School of Nursing. Huskey is a career diplomat with the U.S. State Department. The Samford English and history major has served in top posts in Kenya, India, Taiwan and China, where he was the only U.S. official to witness the Tiananmen Massacre in 1989. Now based in Washington, D.C., as counselor in Senior Foreign Service, the Dothan, Ala., native is responsible for inspecting 270-plus U.S. missions abroad. He earned a Ph.D. in U.S. diplomatic history at the University of North Carolina-Chapel Hill. MaryAnn Moon is in her 20th year on the faculty at Huntsville (Ala.) High School, where she uses her degree in history to teach government and politics. She is also senior class adviser and academic team coach. She was named Secondary Teacher of the Year in 2009-10 by the Alabama Parent Teacher Association, and has helped recruit many outstanding students to attend Samford. Rickie Moon is a senior systems engineer Teledyne Solutions, Inc., in Huntsville, Ala. He enhanced his undergraduate degree in chemistry and math 20 years later with a master's in environmental management. Before joining Teledyne in 1988, he was a consultant air quality meteorologist with the U.S. Air Force and in the private sector. The Moons are the fifth couple to be honored as alumni of the year. Together, they attend many Samford events and host summer events for incoming freshmen and their families. Devereux is managing pharmacist and vice president of clinical operations for FMS Pharmacy in Bessemer, Ala. A specialist in diabetes education, he implemented a nationally accredited diabetes education program at the pharmacy. He was a 2011 recipient of the One to One award in patient counseling from the American Pharmacists Association. Alumni Association annual giving board president David Spurling recognized classes that have shown special leadership through financial support of their alma mater. Honored classes were: Class of 1942, highest percentage of donor participation (50 percent); Class of 1961, highest amount contributed ($1,045,939); and Class of 1970, largest number of donors (70). Saturday's schedule will feature opportunities for many reunion groups to gather, and several were well represented at the banquet. Vice president for university advancement Randy Pittman noted the Classes of 1952 and 1962, and a contingent of "Missionary Kids" that spanned classes from several decades. MKs, as they are called, are children of missionaries who serve internationally. Samford president Andrew Westmoreland reminded the alumni that experiences such as Homecoming allow them to rekindle the past and feel hopeful about the future. Despite much rhetoric about current difficulties, he said, "You can't hang out at Samford very long without feeling hopeful about the future. It's in God's hands, and Samford is in God's hands."